The Làlomèna is found in the waterways of Madagascar. It has two very red horns and looks like an ox. 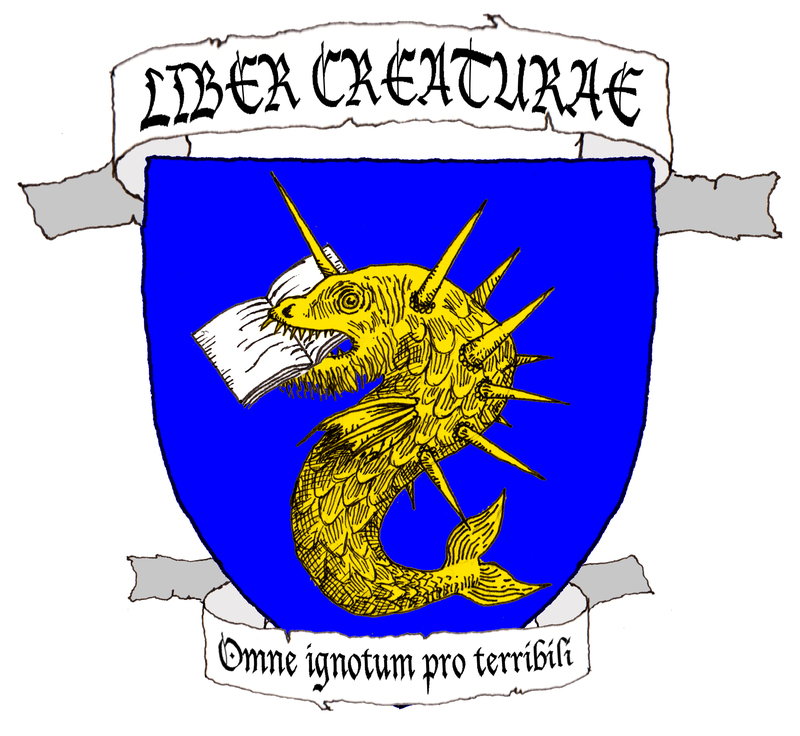 It is among the strongest of aquatic animals, but little more is known of its appearance and attributes. Sub-fossil remains of Madagascan hippos have been referred to as làlomèna bones. Sibree, J. (1896) Madagascar Before the Conquest. Macmillan, New York. Issitôq, “giant eye”, is a gloomy helping spirit that appeared to the Iglulik Inuit mystic Anarqâq. As Anarqâq had just lost his parents, Issitôq consoled him. “You must not be afraid of me; I, too, struggle with sad thoughts, so I will go with you and be your helping spirit”. Issitôq has short bristly hair that stands straight up. Each of its eyes is in two sections. Its mouth is vertical, with a single long tooth at the top and two shorter ones at the side. It specializes in finding taboo-breakers. Rasmussen, K. (1929) Intellectual Culture of the Iglulik Eskimos. Glydendalske Boghandel, Nordisk Forlag, Copenhagen. Fishermen on the Isle of Man have traditionally observed a number of customs. Whistling on board “bothers the wind” and is discouraged. Sticking a knife in the mast on the appropriate side causes the wind to blow from that direction. Losing items on board is bad luck; borrowing items from “lucky” boats brings good luck. Four-footed land animals should not be mentioned by name, but instead by a circuitous sea-name – rats, for instance, are “long-tailed fellows”. Cold iron is a remedy to most acts of bad luck. Then there is a number of sea creatures that can wreak havoc on fishing vessels. Of the the Beisht Kione Dhoo, the Beast of Black Head, is the most terrifying. It makes its home in the sea-caves on Black Head, near Spanish Head at the southern tip of the Isle of Man. The few who have seen it say it has a head like that of a large horse, and it can be heard roaring by fishermen off Spanish Head. Some say it is the soul of a man killed by pirates in order to protect their treasure hidden in the headland’s caves. Nobody has attempted to claim that treasure. To placate the Beisht and bring on good luck, rum is left in the cave at Spanish Head. Fishermen heading out to sea would throw a glassful of rum overboard in hopes that the Beisht will grant them a bountiful catch. Broderick, G. (1984) A Handbook of Late Spoken Manx: Grammar and Texts. Max Niemeyer, Tübingen. Killip, M. (1976) The Folklore of the Isle of Man. Rowman and Littlefield, New Jersey. South of the Niu-Trees Mountain in China has red metal on its southern slope and white metal on its northern slope. It is also home to the Lushu, which looks like a horse with a white head, a red tail, and stripes like a tiger. Its cry is like a human singing. Wearing the lushu from one’s belt ensures the conception of many descendants. While the Shan Hai Jing is unclear on the subject, Guo Pu clarifies that a piece of the lushu’s skin and hair ensures fertility. Its red tail may be a symbol of its vigor and potency. The stripes suggest that the lushu may be inspired by a number of striped ungulates – zebras, wild donkeys, or even okapis. Mathieu cites the polygamy of zebras and the historical virility of donkeys, but it probably is not an extinct species of red-tailed zebra. The Fei or Fei-beast can be found on Great Mountain, the eighth and last of China’s Eastern Mountains. It is shaped liked an ox, with a white head and a single eye. Its tail is that of a snake. When a fei moves over grass, the plants below it wither and die. When it crosses a stream, the water evaporates at its touch. Its appearance is an omen of worldwide plague and wars. The Roperite is one of the few Fearsome Critters found outside the northern lumberwoods. Its home is in the foothills of the Sierra Nevada where the digger pine grows, and it tends to live in herds. An active and gregarious animal, it has not been seen in a while, and there is concern that it may already be extinct. Roperite biology is a mystery. We know that it is the size of a small pony, and that it has a a remarkable rope-like beak which it uses to lasso its prey. Its skin is leathery and impervious to the thorn and rock of its chaparral habitat. Its legs are well-developed and flipper-like. A. B. Patterson of Hot Springs, CA, reported a tail with a large set of rattles. It is unknown whether roperites are bipedal or quadrupedal, whether they are fish, fowl, or beast, and whether they lay eggs, give birth to live young, or emerge fully-formed from mountain caves. Local legend has it that they are the reincarnated ghosts of Spanish ranchers. Roperites run at blistering speed. Their legs give them a gait halfway between bounding and flying. Nothing can outrun them, and no obstacle can slow them down. Even roadrunners are trampled or kicked aside. Roperites are predators that chase down their prey and lasso them with incredible dexterity, then proceed to drag their through thornbushes until they die. The rattles on the tail are used to impressive effect during the chase, intimidating quarry with a whirring din worthy of a giant rattlesnake. Jackrabbits and the occasional lumberjack are taken. Brown, C. E. (1935) Paul Bunyan Natural History. Madison, Wisconsin. Cox, W. T. (1910) Fearsome Creatures of the Lumberwoods with a Few Desert and Mountain Beasts. Judd and Detweiler, Washington D. C.
Tryon, H. H. (1939) Fearsome Critters. The Idlewild Press, Cornwall, NY.